Almost wherever you are in Cardiff you can see the hills of the valleys to the north and the Bristol Channel to the south. As the Capital city of Wales, there are a wealth of cultural landmarks, civic buildings and tourist attractions. My father Andrew Fitton is an Artist by occupation. He studied at Cambridge College of Art from 1967 to 1969 and later Swansea Art School from 1969 to 1972. Andrew has produced art through his working life. He has painted a number of views of his favourite places in Cardiff. Many of these are iconic views of our city. Andrew’s influences include Paul Cezanne (1839 – 1906) and two artists influenced by Impressionism… Ernst Ludwig Kirchner (1880 – 1938) and Robert Delauney (1885 – 1941) The Impressionist style is much loved for it’s use of vibrant colour, subjectivity and depiction of outdoor views with the artist’s own individual responses and creativity incorporated into the work. The title reflects the influence of the Impressionist Art style on Andrew’s work, and also the fact that the art hopefully gives a good impression of the locations depicted…! Individually and together, the paintings offer an excellent depiction of some of Cardiff’s most iconic locations which are significant to the city’s culture, heritage and social life. Andrew’s painting ‘An Impressionist View of Cardiff Castle’ offers a unique depiction of this tourist attraction, and symbol of Cardiff’s heritage. ‘The Hayes Island Cafe’ portrays the popular venue in the heart of the City Centre, and shows people visiting the cafe and sitting at tables outdoors in the Hayes. Andrew’s view of ‘Castle Arcade’ highlights it’s Victorian style architecture, boutique shops and independent cafes which contribute to Cardiff’s lively cafe culture. ‘A stall on Cardiff Central market’ shows a stall offering an abundant array of vegetables and produce highlighting the contribution of independent and local retailers in the city. The image of Roath park depicts the expansive lake, the Captain Scott Lighthouse, and looks across to the tree lined verges and Lake Road East beyond it. The business also features art by Andrew featuring views of Swansea. I’m enjoying operating Impressions of Cardiff and Swansea. Independent businesses bring unique and diverse goods and services, and offer alternatives to high street chains. I hope this sector continues to grow and thrive in the years ahead. 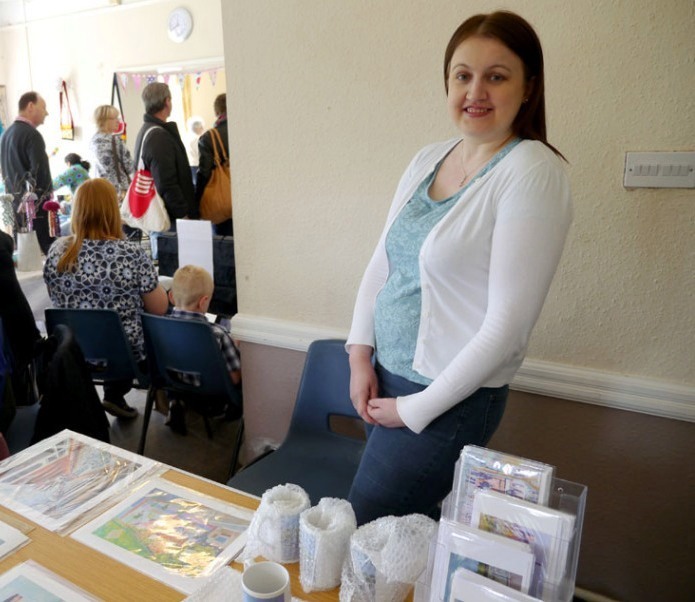 Rosie was photographed at the Roath Craft Market in the Mackintosh Community Centre, by Amy Davies. Interesting Post about Cardiff, the Welsh Capital from We Are Cardiff!